James F. Holland, MD, is the Distinguished Professor of Neoplastic Diseases at the Icahn School of Medicine at Mount Sinai in New York and practices in hematology-oncology at The Mount Sinai Hospital. Created the first combination chemotherapy program in acute leukemia at the NCI in 1953, resulting in the formation of Acute Leukemia Group B, a research collaboration that later became known as the Cancer and Leukemia Group B. 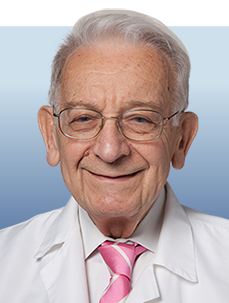 Worked with Emil J. Freireich, MD, to develop the POMP chemotherapy combination of methotrexate, mercaptopurine, vincristine, and prednisone for children with acute lymphoblastic leukemia. Constructed the 7 + 3 regimen for administering cytarabine and daunorubicin to adults with acute myeloid leukemia. First identified cisplatin for the treatment of patients with testicular cancer and doxorubicin for individuals with osteosarcoma. Co-authored the Cancer Medicine textbook with Freireich and Emil Frei III, MD, which has become an influential oncology reference book now in its eighth edition. Served as special consultant for a cancer research initiative in the former USSR in 1972-1973.